Physician Carmen Sceppa (seated) and exercise physiologist Jennifer Layne examine a digital image of skeletal muscle to assess sarcopenia. Sar-co-PEE-nee-ah. It starts to set in around age 45, when muscle mass begins to decline at a rate of about 1 percent per year. This gradual loss has been tied to protein deficiency, lack of exercise, and increased frailty among the elderly. 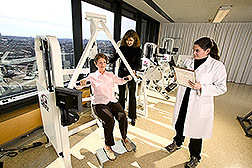 Researchers at the Jean Mayer USDA Human Nutrition Research Center on Aging at Tufts University (HNRCA) in Boston, Massachusetts, have been studying the various factors involved in sarcopenia since 1988. 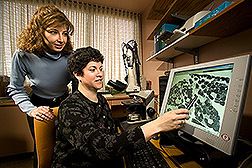 The work is conducted at the center’s Nutrition, Exercise Physiology, and Sarcopenia Laboratory (NEPS), led by acting director Carmen Castaneda Sceppa, a physician specializing in nutrition. There, the researchers use a variety of study designs to discern factors such as nutrition, hormones, and immune responses that influence loss of muscle mass. The NEPS laboratory’s researchers have repeatedly shown the safety and effectiveness of resistance, or strength, training in reversing sarcopenia and frailty in the elderly. A NEPS study published last year, for example, showed that a home-based exercise program improved functional performance and balance in 70 participants aged 70 or older. Such strong findings come at a time of increased emphasis on exercise. The recently released 2005 Dietary Guidelines for Americans strongly emphasize the importance of physical activity and diet in health promotion and place much greater emphasis on exercise than in the past. The Institute of Medicine (IOM) added exercise recommendations to its dietary advice—essentially doubling the Surgeon General’s 1996 recommendation for moderate physical activity, from 1/2 to 1 hour daily. “Moderate physical activity” refers to movement such as walking, gardening, or bicycling. 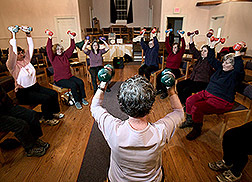 Strong Living Program regional coordinator Ronnie Friedman (center) leads an exercise class at the Westminster West Congregational Church in Westminster, Vermont. The laboratory’s researchers are also conducting studies to examine how exercise affects chronic degenerative conditions such as diabetes, kidney disease, and arthritis. “It’s important to understand how resistance training helps maintain or improve muscle mass in the presence or absence of chronic diseases,” says Castaneda Sceppa. The human body reacts to protein deficiency by taking amino acids (the building blocks of proteins) away from muscle tissue and other areas of the body. The process, in which the body basically metabolizes itself, is called catabolism and leads to muscle loss and weakness. Castaneda Sceppa and colleagues are now studying whether the most healthful amount of dietary protein differs with age. They are examining the protein intakes of several elderly men and comparing them to those of younger men. In another study, the scientists are using 28 days of bed rest to mimic the effects on muscle mass that occur in astronauts during space flight and in others from muscle disuse or a sedentary lifestyle. They are looking at whether exercise, combined with a protein supplement, can counteract the effects of muscle loss under those conditions. CT scan of a thigh muscle of a healthy young adult. The thigh bone is white. 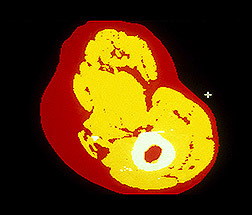 The muscle area (yellow) is not indicative of sarcopenia. Protein-restricted diets are sometimes recommended because of certain health conditions in which excess nitrogen may not be adequately excreted through urine. But there are risks involved for those consuming insufficient protein. While the low-protein diet may help those with chronic kidney and liver insufficiency, for example, it is known to lead to muscle loss. Last year, the NEPS researchers reported on a study involving a group of volunteers with chronic kidney disease who consumed a low-protein diet. About half the group engaged in resistance training, while the other half served as a control group. Among the strength-trained participants—who exercised for 45 minutes (including warm-up and cool-down) three times per week for 12 weeks—measurements taken before and after the study period showed that, on average, total muscle fiber increased by 32 percent, and muscle strength increased by 30 percent. “Those who did not exercise lost on average about 3 percent of their body weight, or about 9 pounds,” says Castaneda Sceppa. In addition, when compared to the control group, the exercisers reduced their blood levels of two key inflammation factors. That result is tied to better nutrition and functional capacity. CT scan of a thigh muscle of a sedentary older adult. The thigh bone is white. 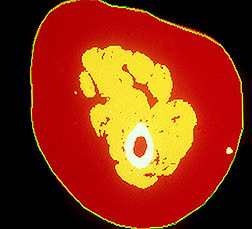 The greatly reduced muscle area (yellow) indicates sarcopenia. In 1995, HNRCA researchers started a grass-roots initiative to provide community-based exercise to older adults at little or no cost to participants. The program was inspired by studies at the NEPS laboratory that had revealed startling results: some of the volunteers older than 60 had doubled their leg strength and some older than 90 had put down their walking canes. Local Strong Living Programs consist of a 12-week core class that meets on an ongoing basis. This allows participants the opportunity to exercise year round as part of a group with a trained instructor. All program leaders must complete a daylong interactive training workshop led by Layne and the Tufts Strong Living team, and complete an exam to become certified to teach classes. Each leader receives a 136-page custom program manual with detailed step-by step instruction on how to start, teach, and evaluate the program. Program leaders range from allied health professionals, including nurses and physical therapists—who offer the program at hospitals and outpatient clinics—to volunteer peer leaders who teach the program at local community centers, town halls, and churches. As part of the Strong Living Program, exercise physiologist Jennifer Layne (middle) and program coordinator Charlotte Mallio test a volunteer's muscle strength in the Nutrition, Exercise Physiology, and Sarcopenia Laboratory. Layne works as a team with Castaneda Sceppa and coordinating staff assistant Charlotte Mallio to manage the Strong Living Program. They collaborate with participating states’ departments of public health and elder-care services, which provide a mix of funding, space, and personnel. “We have an application-and-assessment process that ensures the quality and safety of the program and its leaders. And each exercising participant’s functional and health status is assessed before enrollment,” she says. Layne has trained more than 350 leaders in the past 4 years. The program has been conducted in 3 states at more than 90 different locations. Each class session runs for about 1 hour and is attended by 10 to 12 participants on average. Latest statistics show a total enrollment to date of more than 3,000 participants, who range in age from 50 to 98 and average age 72. “As people age, there is a large shift in their balance, agility, and body awareness,” says Layne. “These classes provide strength, balance, and flexibility exercises.” Leaders use an “Exercise Intensity Scale” to determine the appropriate starting weight for each participant. The exercises are performed using low-cost equipment, such as ankle weights and dumbbells. They are designed to accommodate older adults with a wide range of abilities, who exercise in a group setting. Exercise is, by definition, different from the moderate physical activity recommended by the 2002 IOM guidelines. An important difference, Layne explains, between physical activity and exercise is that strength training requires explicit skills and knowledge to perform. “Instruction from a trained individual is important, particularly for older adults,” she says. Exercise is designed to improve the five key components of physical fitness: cardio-respiratory endurance, muscle strength, muscle endurance, flexibility, and body composition. Overall, Strong Living Program successes include a 25-percent increase in lower-body function and a 32-percent increase in balance. This year, a special group of participants with a joint disease, osteoarthritis, were tracked. Their balance improved by 55 percent, and muscle strength increased by 14 percent after a single 12-week program. Their flexibility improved by 17 percent, and their self-reported pain decreased by 30 percent. Progress is tracked through overall program surveys and individual participants’ physical function assessments. Communication is maintained through data collection and regular newsletter mailings, which are coordinated by Mallio. Promotion and recruitment for the program are through word-of-mouth. “The demand is so great that we have a waiting list for participants who want to enroll and for leaders who want certification training,” says Layne. The HNRCA team has set a goal to expand the Strong Living Program to every state. To find out more, call or write Layne using the contact information below.—By Rosalie Marion Bliss, Agricultural Research Service Information Staff. Carmen Castaneda Sceppa and Jennifer Layne are with the Nutrition, Exercise Physiology, and Sarcopenia Laboratory, Jean Mayer USDA Human Nutrition Research Center on Aging at Tufts University, 711 Washington St., Boston, MA 02111; phone (617) 556-3081 [Sceppa], (617) 556-3329 [Layne], fax (617) 556-3083. "Low Protein + Low Exercise = Sarcopenia" was published in the May 2005 issue of Agricultural Research magazine.